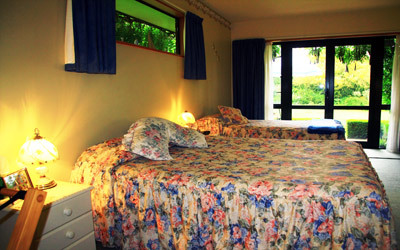 Cedar Park Gardens offers B&B accommodation located in Rolleston, Canterbury. 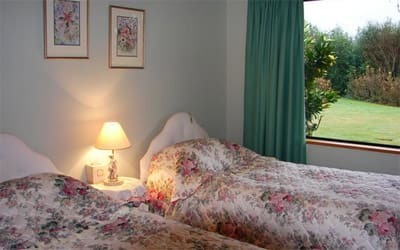 Cedar Park Gardens is a delightful B&B, set in 1.5 acres of trees, perennials, shrubs and bulbs in a secluded setting at Rolleston, on the southern outskirts of Christchurch, Canterbury, South Island, New Zealand. Guests are invited to relax in and enjoy our lovely private, rural gardens. Delicious substantial breakfast is included. Option to dine in the evening with your hosts and enjoy a delicious home-cooked meal prepared with home-grown produce and a complimentary wine. Requires prior booking. Rolleston is situated on State Highway 1 (Main South Rd) 25 km from the very centre of Christchurch and 20 min south of Christchurch International Airport. Cedar Park Gardens B&B is an ideal stopover for those travelling to or from the south of the island, or for those who wish to base themselves within easy reach of Christchurch City (without all the hustle and bustle of city life) and to explore Canterbury. Very peaceful and quiet in stunning surroundings. Tranz Alpine Scenic Train; Complimentary drop off and pickup from the Rolleston Railway Station for guests. We provide quality bed and breakfast accommodation in our comfortable modern home which is located 2km off the Main South Rd. Our home is situated at the end of a private lane with secure parking at the door of the guest room. Ground floor, no stairs to climb. Your Hosts Anne and Ron Finch have many interests and are very willing to help with any queries you may have regarding your stay or activities in the area and can arrange bookings for you. Some French spoken and understood by Anne.